I'll be truthful, usually I come back from a blog-shoot on a high, it feels like a sugar-fied rush, running like a sweet treat through my veins, but I've been suffering from bouts of anxiety for the best part of two weeks and that wasn't the case last weekend. Last Saturday I was having one of those "girl days" where I felt pretty vulnerable and the last thing I wanted was to pose in a tight dress, but, determined to keep up the spirit and slay the shoot I'd wanted to create for the past few months, I went for it. We had a good time but unfortunately there were a group of idiots standing there purposefully, laughing, threatening to photobomb and making it increasingly difficult to shoot (and this was before we even brought the ice cream pool float out, fortunately they'd pissed off by then) I heard them making little remarks like "how many photos do they need to get, they're all the same anyway." (Insert a C U Next Tuesday slot here). Strengthened by our resolve to get the shoot we wanted, we kept on and looking at these pictures now, I'm so happy we managed to carry on. This rainbow babe is from Skinnydip London of course. Talking of Skinnydip, I'm thrilled they've released an intergalactic cowgirl range, loving it. For a while after their unicorn and mermaid dazzlers I was eagerly awaiting some new babe-licious bags and now they've stunningly stayed. 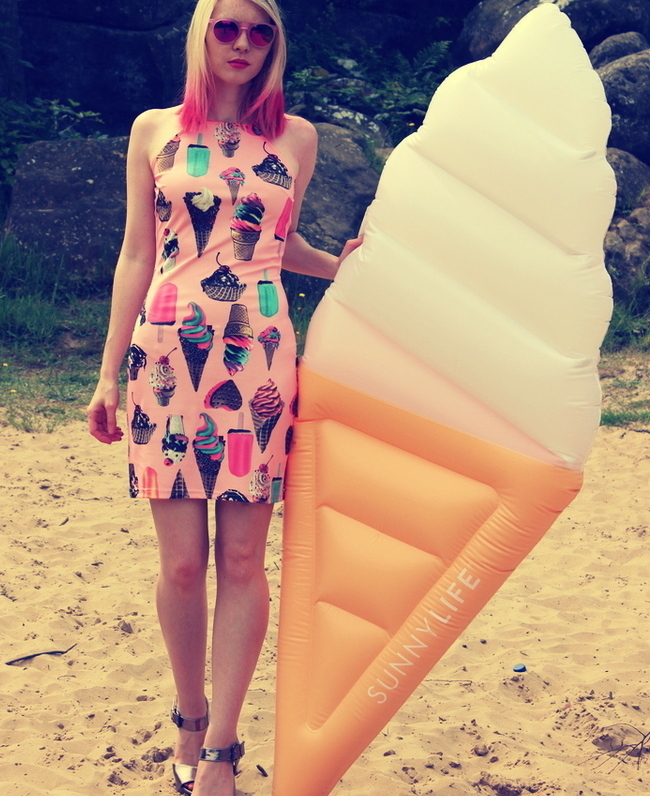 And the infamous ice cream pool float from Sunnylife Australia was made for this shoot, fast becoming another of my favourite brands. I'm hoping I can regain control of my anxiety as I've been doing so well this year. For me it usually comes in fits and starts. I end up in a vicious circle; worrying myself to sleep at night, feeling constant dread throughout the day, terrified I'll make myself ill which leads to feeling ill and constantly drained, down, shaky, dizzy. It's little moments like receiving a text from my favourite boy whilst sitting in the garden, surrounded by fresh air and a cup of tea, getting lost in a good book, dreaming up the ending of my own, getting inspired in the intrinsic world of Instagram, driving endlessly through botanical lanes filled with flowers, chilling with Graham by the beach, and of course, this blog and the whole magic surrounding it that sees the solution and the silver linings for me. That and taking one day at a time. I forever thank you guys for being there and always believing in me, I overuse this expression to the moon and back, but it really does mean the world. All the ice creams, rainbows and pool inflatables sent from my soul to yours, let's celebrate summer like the babin' babes we are! High five to that. What's everyone up to on this (not so sunny) Saturday? So relatable Sophie! I struggle with my anxiety in the same way you do: and I love how we can talk about it together! I'll always be there for you girl! Now: for the outfit: OMG! I absolutely love your bag(s). You have the best ones girl! Aw babe! 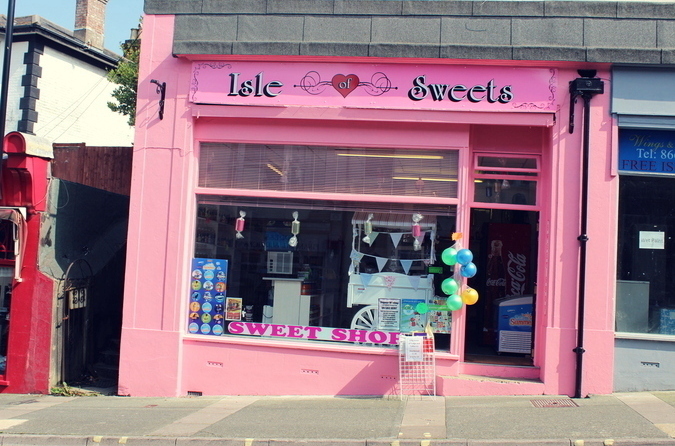 You are so sweet. Thank you for believing in me as well! I adore everything about this post, especially that amazing purse! Loving these pastel beachy vibes babe! Looking magical as ever Sophie, looking like you could be the lead in a Del Ray music video - also I am in love with that bag oh my word, would walk to the end of any rainbow to get my hands it<3 Clearly irritating individuals were desperate to share your spotlight, but have zero chance of succeeding.. Truly sending you all the good wishes Sophie, the intensity of anxiety is so often lost in it's rhetoric and increased prominence in the media etc; words alone can do it no justice. You're a true star and don't ever let it stop you sparkling. GRR I'm still angry at these utter wankers!! Who even cares about them as you are totally SLAYING in these photos. I can't get over how cute your freckles are. 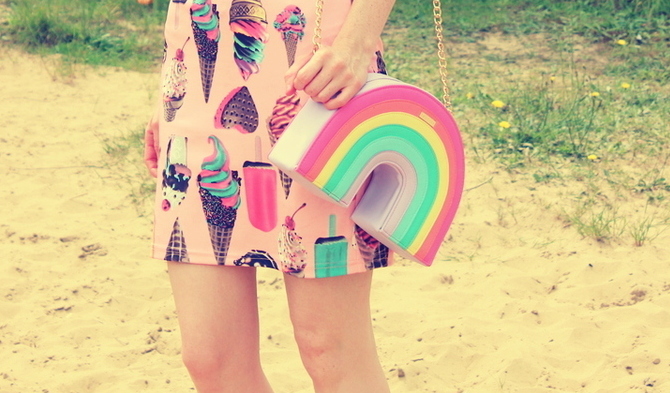 Love this colorful dress, loving the ice cream float and totally obsessed with that bag! 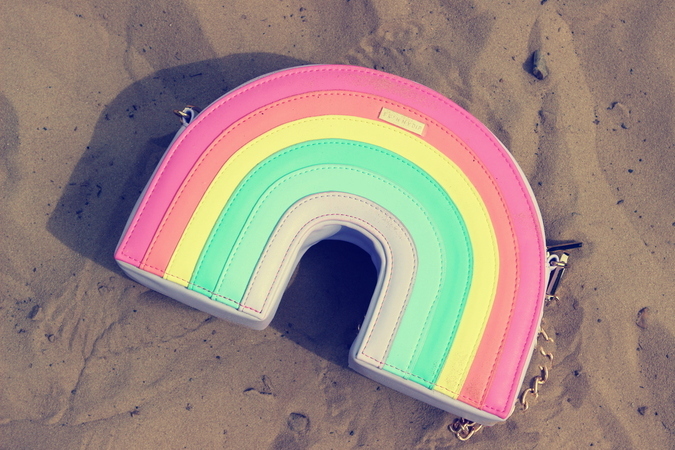 All gorgeous unicorn rainbow-ness. Such a fun outfit! 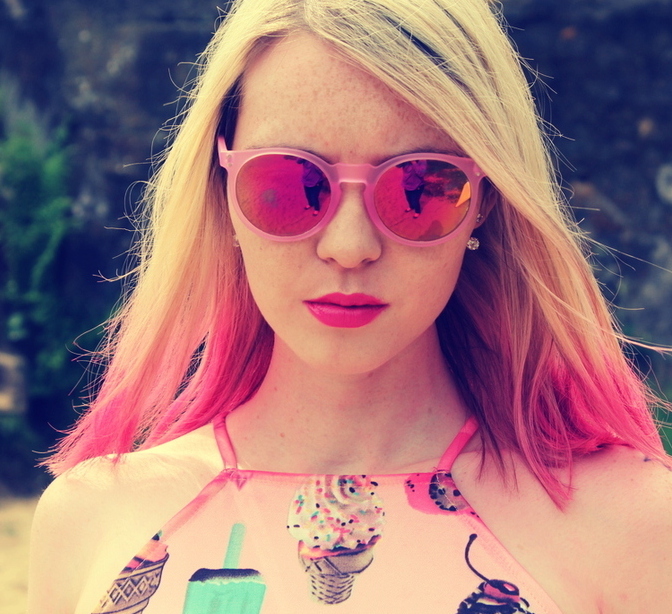 You've such a great job at tying the whole look together with the bag and sunnies, and love the pink tips on your hair! I love your writing style too, it's like a mini book in each post, so lively and descriptive! OHhh f*ck those assholes! They're lucky I wasn't there, I'd show them! haha :) You look so dreamy Soph, really loving this dress on you! So sorry you've been dealing with anxiety lately, it's the worst :( I had a few rough weeks too, not too long ago, I just wish I could somehow stop thinking sometimes and unplug my brain haha :) Know that I'm always here for you, if you need me!! Any time, day or night!! You are looking so beautiful dear, amazing photos! Pretty dress! You are so beautiful! You are so gorgeous, you shouldn't pay atention to those idiots. You are totally slaying ! i'm so appalled that people actually go out of their way to be rude! i can understand people being confused and staring, but being loud and obnoxious is so unnecessary. sorry you had to go through that :/ you look amazing though! i always love seeing the bright colors on your blog(: and i hope your anxiety waves fade into calm waters soon! i do the same thing with stress: take things one day at a time. 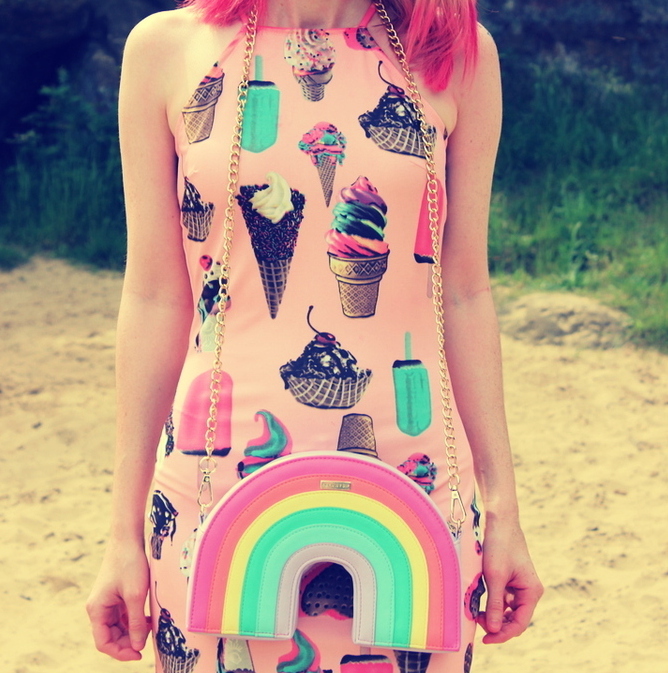 I want this ice cream dress . so cute looks.